Overlooked Virus May Be Cause Of Paralyzing Disease In California : Shots - Health News Doctors have diagnosed a handful of children with a polio-like disease that can paralyze an arm or a leg. The culprit may be a rare virus first detected in California more than 50 years ago. Sophia Jarvis, 4, of Berkeley, Calif., is one of the few children diagnosed with the polio-like disease, which left her arm paralyzed. 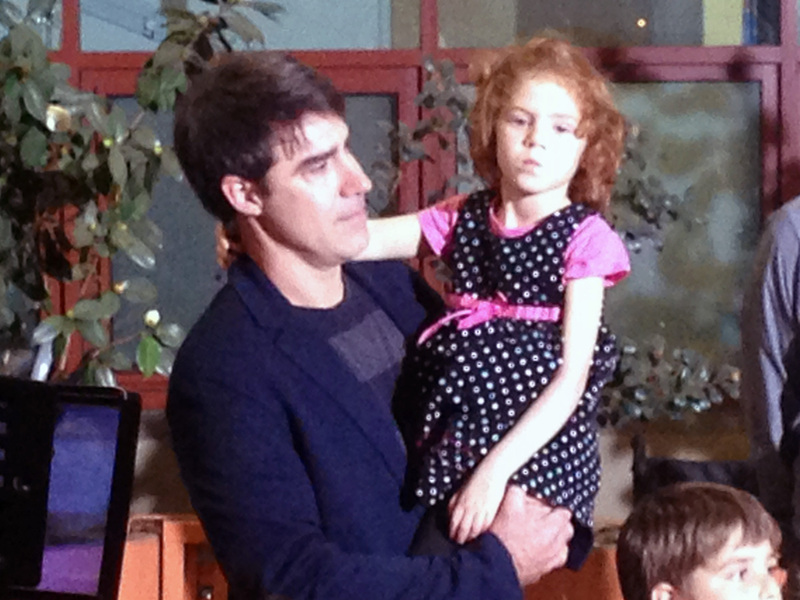 She attended a press conference Monday at Stanford University with her dad, Jeff. Doctors in California are puzzled by an illness that has paralyzed at least five children and may have affected about 20 others. Sick children had symptoms similar to polio. They lost muscle function in an arm or a leg over a few days. So far, the children haven't responded to any treatments and the paralysis has been permanent, doctors from Stanford University and the University of California, San Francisco, said in statement Sunday. The doctors suspect the culprit is a virus related to one that causes hand, foot and mouth disease. Called enterovirus-68, it was first detected in California more than 50 years ago. There have been about 50 cases of the virus reported in the U.S. since 2000. It sickened at least 21 children in the Philippines between 2008 and 2009. The current cases have alarmed some parents. But it's worth pointing out that the illness is quite rare. There's little threat the disease will spread, Dr. Jane Seward with the Centers for Disease Control and Prevention told Scientific American. Many viruses, including West Nile, echovirus and adenoviruses, can cause paralysis of the limbs, Seward said. So she would expect California to report about 80 paralysis cases each year, if the CDC was looking out for this type of symptom. "These researchers only report on five cases in the abstract," Seward said. "We are not unduly alarmed," she added. Nevertheless, the doctors investigating the disease want parents to be aware of it. "Any time a parent sees symptoms of paralysis in a child, the child should be seen by a doctor right away," Stanford University neurologist Keith Van Haren wrote in a statement Sunday. He will present information about the five confirmed cases of the disease at an upcoming scientific meeting in Philadelphia. Van Haren and his colleagues think damage to the spinal cord causes the paralysis. MRI scans of the children's spines show injury patterns similar to those found in people with polio. But all children with the illness had been vaccinated for polio. "We know definitively that it isn't polio," Van Haren told The Los Angeles Times. Instead, two of the children tested positive for the enteroviruses-68. Tests for many of the other cases are still pending. There are about 60 enteroviruses, and they sicken millions of people each year. Vietnam recorded nearly 175,000 cases of hand, foot and mouth disease in 2011 and 2012. A large proportion of those cases were connected to enterovirus-71.